They have this thing here in France that I have been wanting to try for ages. It’s a sort of water cure, very 19th century in spirit. If they use salt water it is called thalassotherapy. If they use fresh water I think they call it a cure thermale. Finally I got my chance. I was invited to go to the Novotel in Dinard, where someone, I believe a subsidiary of Novotel, runs a thalassotherapy program. I had my doubts. Really, a Novotel? I was assured it would be fine. As you can see by the photo above, taken just outside the room, it was. As I have no belief in the idea that one week of diet and exercise will change my silhouette, much less my life, I opted for the relaxation, well-being and Zen program. Though no actual Zen practice took place, I think it was a good choice. I spent four hours a day for six days toddling from one salt-water pool to another. Most of them contained jets. A shallow swimming pool had a jet that we moved in front of, to give ourselves a sort of jet massage. A shallower, individual tub had a similar jet at the end of a hose. A nice lady — there were no men working in the individual treatment rooms — used it to do a similar thing. Another tub had little spritzer-type jets that automatically moved from my feet to my shoulders. And finally they said enough with the jets and put me back in the shallow pool for a little light-duty aqua-aerobics. Down in the silent basement they had pods. Creepy, until you went inside, where you found a waterbed with, yes, jets, that moved shoulders to toes while the light changed colors overhead. At least I could stay dry for that one. Just to mix things up I got a couple of regular massages, which was absolutely my favorite thing. It would take me a long time to get tired of having a really good Swedish-shiatsu hybrid massage, every other day. And finally, my least favorite thing, the algae wrap. The algae was turned into a warm green slush that smelled like a sushi bar. Plus it itched. Maybe that was the Zen part, as you had to just go with it, distract yourself however you could, because in five or ten minutes the itching stopped and it was fine until they unwrapped you, when the sushi smell came back. It only got too weird the time when the ambient music included the sound of croaking frogs. Between treatments we could sit in relaxation areas, including one that served a very decent herbal tisane. And bless them, they banned cell phones from the treatment areas. True, I did sometimes sneak down to my room to check my email but I appreciated having a wifi-free zone. I was surprised by how padding around in a bathing suit and bathrobe turned me into this little passive creature. I just wandered from one space to another, waited for my name to be called, did what I was told. I wonder what the psychological mechanism is for that, as everyone seemed quite docile, not like regular busy adults at all. Zipping down to check my email felt like cutting school — not that I had any actual experience of that, of course. Certainly not. I have to admit I was a little worried about these jets. I thought of that movie where Kate Winslet is put in an asylum where they “cured” her by standing her against a concrete block wall and basically turned a fire hose on her. Really, where did they get such ideas? But actually any time you dealt with jets, you were already immersed in the water, plus it was always warm. I was also worried that I would be subjected to some sort of effort to improve me. I can use it, but so what? But no, it never happened. From my pain au chocolat at breakfast to my wine with dinner it was all about enjoying the experience. It was a week well spent. 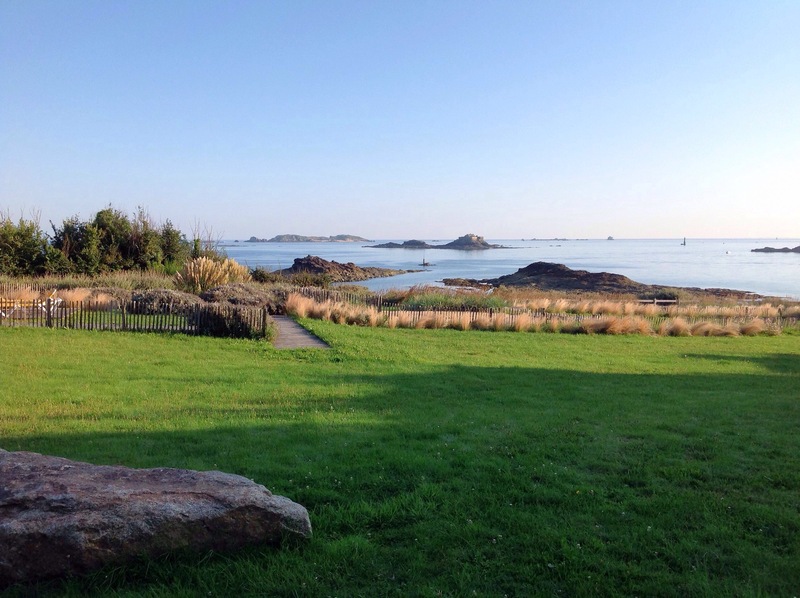 I could return to Dinard but I think I’d like to try a few other places. Wherever I go, I hope I return home feeling as, well, buoyant, as I did after this week. I fell more relaxed just reading about this! Oh yes. Gerard, you would like this. Linda would love it. When you are done for the day, the TV has a zillion channels and the wifi is free and rock solid. Then there is everything to do off the property. Absolutely. The break was great. I think if there was any real therapy going on, it was thanks to the extra sleep. Some days I could barely keep my eyes open!